Trump Says Attorney General Sessions Should Investigate 'New York Times' Op-Ed The president told reporters he thinks the Justice Department should look into the identity of whoever wrote the column questioning his fitness for office, citing "national security." Asked whether Attorney General Jeff Sessions should investigate an anonymous opinion piece published by the New York Times, President Trump said he should. Trump spoke off camera aboard Air Force One en route from Montana to North Dakota. He remains angry and frustrated about the op-ed, according to the pool report, calling it "a disgrace" that someone would write it and "maybe even from the standpoint of national security, we'll find out about that." After those comments a reporter asked about Sessions, and Trump said he thought the attorney general should investigate. Trump was then asked whether action should be taken against the Times. "I'm looking at that right now," the president said. As for the person who wrote the column, whose identity and gender remain anonymous, Trump said: "We're going to take a look at what he had, what he gave, what he's talking about, also where he is right now." The Justice Department was asked about Trump's comments on Friday and told NPR that it does not confirm or deny investigations. It wasn't clear what action might result from the president's comments or the continued search by the administration to find the author of the column. 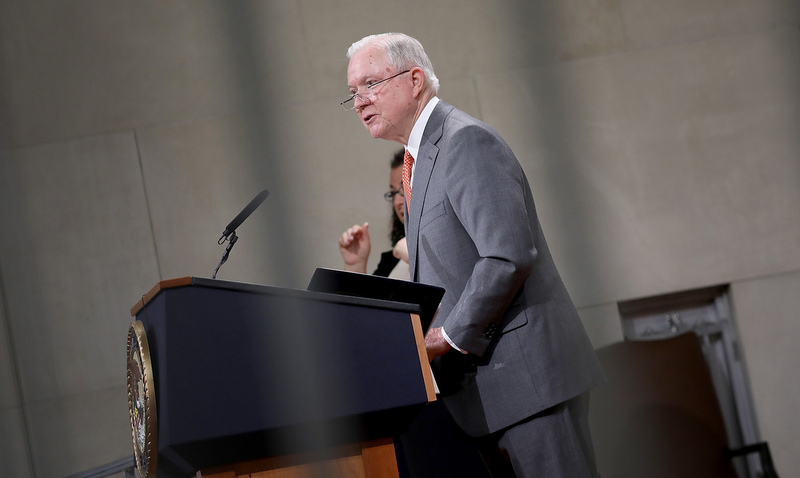 Trump sometimes badgers Sessions about not doing the work he considers most important, and the men's relationship appears to have largely broken down. Trump says he has buyer's remorse about appointing Sessions because the attorney general recused himself from the Justice Department's Russia investigation. Sessions vows that so long as he is running the department, it will be immune from political pressure. Trump also told reporters that he isn't ruling out an interview with Justice Department special counsel Robert Mueller, who is investigating the Russian attack on the 2016 election. "If we're going to meet, it's got to be a fair meeting," Trump said. "I'd do it, but under certain circumstances." Trump repeated denials that his campaign conspired with the Russian attack or that he might have broken the law by trying to frustrate the subsequent investigation. Trump pointed to the reports about the forthcoming book by Bob Woodward — which Trump partly dismissed as "nonsense" — and said that even Woodward "couldn't find anything about collusion in that big, fat, ugly book with all the misquotes and all the lies." Woodward's account — like that of the Times op-ed — depicts a Trump administration filled with staffers who work around the president or actively stifle his impulses to protect him from doing damage. One of the biggest characters in the book is Trump's onetime personal attorney John Dowd, who is described as pleading with Trump not to give an interview to Mueller's investigators. Trump has such trouble telling the truth, Dowd argues — per Woodward — that even though they agree he has done nothing wrong, the president would still probably contradict himself or tell a falsehood in any discussion with the Justice Department's investigators. Trump's unwillingness to agree to give Mueller a solid "no" led Dowd to resign, according to Woodward, and the president maintained that openness on Friday.